I love a good bulky yarn. This one is Red Heart Grande yarn from Joanns. I think I've knit 10 scarves like this one. Oh well, what's one more. This one got me through the first week of school. Now I need more yarn. Back to school is tough this year. I wasn't ready. I keep feeling like this is some sort of test run and they'll be back home and I won't have to worry about, well, I don't even know. Whatever it is that has my chest all tight. I wish so badly that they went back after Labor Day like we did in the olden days. Seems less abrupt. Trinity stitch: A smaller, less complicated knot than either a popcorn or bobble. It is formed by making a double increase in one stitch followed by a double decrease in the next. Trinity (also called blackberry) is a popular choice for one panel in an Aran motif. Note that at the end of Row 2 there are 2 stitches fewer than you started with. At the end of Row 4, the pattern normalizes to the starting number. That’s a lot of purling! 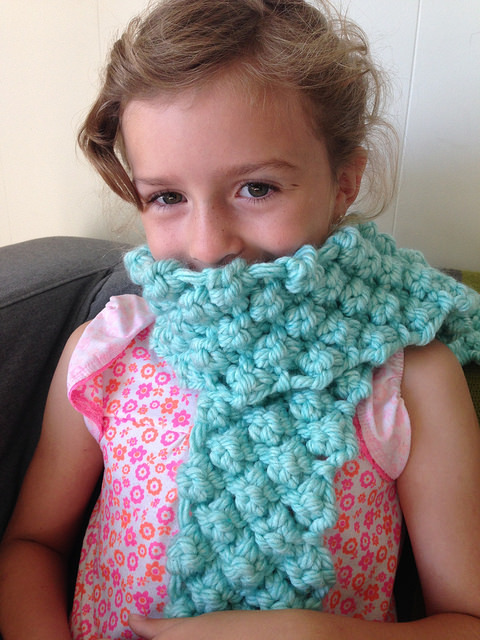 Scarf and a tank top – I love it! Back to school is bittersweet, isn’t it? 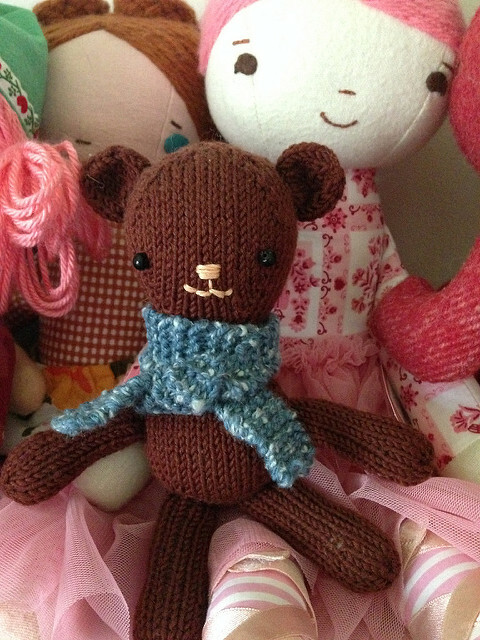 I love the sweet little knit bear! Is there a pattern for him?